Several weeks back in a post about Walden Farms Apple Butter Fruit Spread, it was discussed how Walden Farms had recently come out with a several new spread products and one of those products was a Cinnamon Raisin Peanut Spread. While I just find their regular peanut spread to be okay, the thought of cinnamon and raisins combined with their peanut spread had me wanting more and since I have a love of Walden Farms products and have reviewed many of them, I knew I had to get my hands on this new offering since my favorite way to eat oatmeal is by adding cinnamon and raisins, so I clearly love the flavor combination. Since it is not available at my store, I went searching online and found a twelve ounce jar at Netrition.com for $3.79, placed my order and there it was at my doorstep within three business days. Big props to Netrition for quick shipping time. Anyway, as with all Walden Farms products, this is calorie free, sugar free, fat free, etc. First thing I noticed when I opened the jar was that it had the strong smell of Walden Farms' regular peanut spread and also had the same gelatinous look of that spread as well. When I held it a little closer, I also noticed a strong and inviting smell of cinnamon and raisins and being that those are two of the namesakes of this product, that was an excellent start. Since I wanted to try this on its own for the review and not mix it with bread or whatever, I dug my spoon in and mixed it up a little bit and much to my surprise, there were little bits of raisins spread throughout the jar. Upon closer inspection, they weren't the entire raisin, but instead were kind of like raisin skins (if you look really hard, you can sort of see one in the top right of the jar in the photo above). Odd that they were just skins (how do you de-skin a raisin? ), but I'm down for whatever and what I was most interested in was the taste. 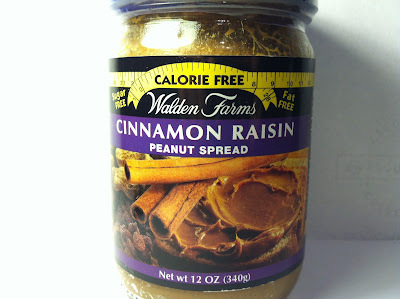 So, I put the spoonful in my mouth and I of course tasted the typical Walden Farms Peanut Spread. The best way I can think of to describe that taste is that it is not quite peanut, but instead peanut-esque. I can't think of a better way to describe it, but it's just one of those things that once you've had it, you'll know it. At first the peanut-esque flavor was all I tasted, but after moving this around in mouth for a bit, I was hit by a nice, but not "spicy" or "hot" cinnamon overtone. It was more of an accent flavor. As for the raisins, well, I didn't really taste them at all. I could feel the "skins" in my mouth, but they really had no flavor. The fact that they broke up the gelatinous texture of the spread was appreciated though and for that reason alone, I'm glad they were there, despite the fact that I couldn't taste them. Buy It or Fly By It? This product had a lot of promise (in my mind), which it failed to deliver entirely on, but I still found this to be pretty good, so I say BUY IT. Despite my absurdly high expectations not being met, I still enjoyed this product quite a bit and honestly, I could see myself eating it straight out of the jar like I do with peanut butter (which is why I don't keep it in my house anymore). That said, after this spoonful, I found myself craving cinnamon raisin bread and if you just spread this on a piece of bread, you could make a poor man's version of it that would save you the time of mixing, baking, etc. In fact, writing this post just gave me my idea for dinner tonight. See, this blog does serve a purpose! Well, at least it does for me. What this is insane! it sounds too good to be calorie free..gotta get my hands on some of this! Netrition is GREAT! I order a bunch of stuff from them...looks like I will be ordering a jar of this stuff too. 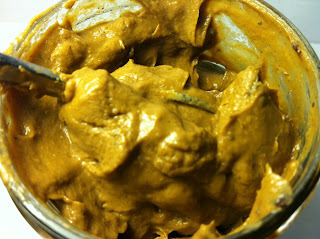 You should try the WF Honey Mustard Mayo (Netrition sells it). It really is good on a turkey sandwich. That was one of the ones that I was thinking of ordering but did not do so. I'll have to add that to my list for my next order. wow - so cool to find your site and see that you love the WF products as much as I (and many others) apparently do. I actually created a spur facebook Page from my FB page as an hommage to them - you should check it out and we can link up to increase the fan base for our beloved WF products. I am also grateful to you for mentioning "netrition" because I am having NO LUCK tring to get the new items into the grocery stores.I ordered the two new Peanut Spread flavors and haven't even let myself try the Choc yet until I finish my Cin-Raisin jar! I love the C-R PS with as much passion as I do the Pomegranate Mayo and the Choc Syrup! Thanks again for your site! That's interesting that you don't smell any raisin odor in the spread. I definitely do! The flavor is interesting. Nothing like the real thing though. I love almond butter better. Would you say this is better or the chocolate peanut spread? I would definitely say this one is better.